In the latest volume of Medieval Textiles and Clothing Camilla Luise Dahl & Isis Sturtewagen present a new analysis and interpretation of the so-called "St. Birgitta's Coif". They argue, very convincingly, that it is not a coif which ties under the chin (something which is typically associated with men), but a cap where the ties are meant to be drawn backwards towards the back of the head instead, resulting in a headdress that would look a lot like these ones from the Maciejowski Bible. 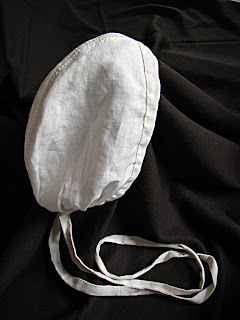 The cap is made up of two pieces of linen fabric sewn together with interlaced herringbone stitch. 8.5-9 cm is left unseamed at the back, creating a split. The bottom edges are pleated and the cap is edged with an embroidered linen strip that continues on to form the ties. Together, the split and the pleated edges create a "pouch" at the nape of the neck when the cap is worn (Dahl & Sturtewagen, 131-133). At Historiska Världars forum, a Swedish re-enactment forum, reconstructions of the cap have been discussed over the past few weeks, and since I'm currently making myself a late 13th - early 14th century wardrobe I was inspired to make one myself. 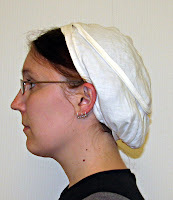 To make my cap, I first took a measurement from the top of my head to the nape of my neck, i.e. the part of my head the cap would cover. I added 8 cm to the measurement (for the split) and used that as a guide when I cut the curve of the two pieces that make up the cap. I made a cotton mock-up to try out the pattern and promptly discovered that the "pouch" was much too large for my short and very thin hair. The cap sagged and looked pretty sad and deflated unless I used the ties to scrunch it up. And the "scrunched-up" version didn't look much like the images in the Maciejowski Bible. For mock-up no. 2, I only added 2 cm for the split, which resulted in tighter cap with a less pronounced pouch that fit me much better, so I used this pattern for my linen cap. 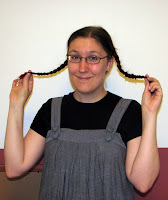 I made these braids from unspun flax and they can be arranged in a number of ways to boost my flimsy pigtails; as long as I cover them up properly they work really well, and I too can have at least the semblence of proper hair! The decision to make the split very short naturally makes my cap less like the original, with its 8.5-9-centimetre split, but it certainly looks better on me. It's nice and tight, which makes it practical to wear as a foundation for a veil too. To join the two halves of the cap, I used a scaled-down version of the interlaced herringbone stitch described by Dahl & Lester in Medieval Textiles and Clothing 4. I've never done any kind of interlaced stitch before, so I decided to keep it simple and made the seam rather narrow - unlike the original where it's approximately 1.7 cm wide. The next cap I make will definitely have a more complex embroidery; it was so much fun to try something new! Dahl, C. L. & Sturtewagen, I. 2008. "The Cap of St. Birgitta", 99-129. Dahl, C. L. & Sturtewagen, I. 2008. "Appendix 6.1. The Construction of St. Birgitta's Cap", 130-134. Dahl, C. L. & Lester, A. M. 2008. "Appendix 6.2. The Embroidery on St. Birgitta's Cap", 135-142.
but you do know that they used false har made of flax? there's several founds of fake flax braids in the netherlands. I didn't know there were actual finds of flax braids! That's great! Do you know where they were found? Are they published? It's beautiful, I'd love to try that too! One find is from 's Hertogenbosh and the other is I think from Deventer (both in the Netherlands). They are both published in Dutch. I think the 's Hertogenbosh publication will be rather hard to find, so if you like I could send you a copy or scans from the chapter with the braids. I will have to look up the other one in a couple of weeks when I'm back in Holland, since I haven't got the book at home. did you receive the scans? I sent them to you last week. Do you know if there's a particular social class or style associated with it? A friend is interested in making one for her persona. Marianne: I think Isis and Camilla must have written about that in their article. In the Maciejowski Bible, a lot of working women seem to be wearing the cap - Ruth in the field is one and others who could be interpreted as servants too. But then again, to me the original cap of St. Birgitta seems to represent skilled craftsmanship and the time invested in the embroideries is also something to take into account. But I'd check with what Isis and Camilla wrote; I'm sure their ideas are better sourced than mine ;-)! I can't quite afford another expensive book right now, But I'll add it to my pile of cool things to get. I'm a 13th century nerd who stumbled on this kind of by accident and I cannot WAIT to make one of these. Thank you so much for posting this! 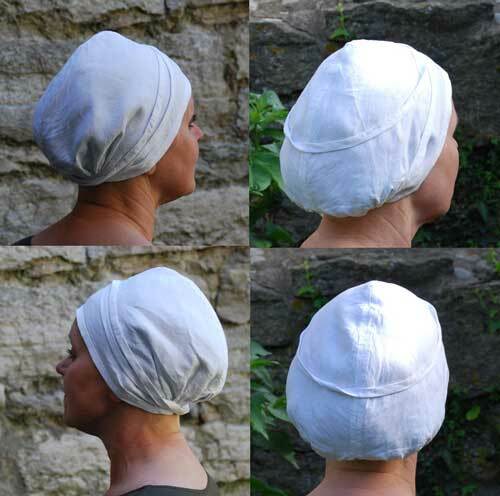 I've been wanting a "Maciejowski cap" for a while as I have kind of the opposite problem from you -- I have so much hair that a lot of period head coverings are actually problematic for me, especially when I try to do things like cook over an open fire. I had seen the St Birgitta coif before but had never made the connection (or seen anyone else make it) -- many thanks to your sources, and to you. Yet another version of the cap. And she went for the full embroidery!! hi!! Nice reconstruction you did!! Have you any knowledge about where to find a (english) explination about how to cut it (if possible with measures) and how to do the Herringbonestitch? 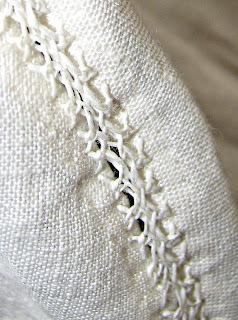 Christina: All the construction info and description of the full version of the herringbone stitch is in "Medieval Textiles and Clothing 4" (eds. Netherton, R. & Owen-Crocker, G. R.). The details of the article are listed under References at the end of the post! Hi. Is it possible you sent me the pattern? I ´ll really appreciate. CH: I don't have a pattern. You have to get hold of the article or take a look in the pdf-file listed under references where you can find Åsa's Birgitta-cap pattern. I'm Vix (short for Viktoria). I'm an archaeologist specialising in crafts and textiles, with an additional degree in handweaving. I work as a curator in a museum and spend most of my time involved with textiles, crafts, living history and RPGs.